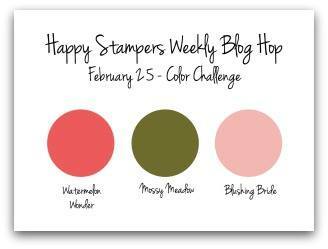 This week's challenge is a Color Combo Challenge: Watermelon Wonder, Mossy Meadow, Blushing Bride. 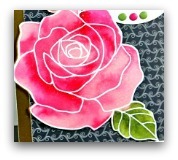 So again, we can use any layout, any stamp set, but use this color combination to ignite your creativity. Watermelon Wonder being one of my favorite colors!!! Today I'm featuring the Remarkable You stamp set by Stampin' Up!, using the water coloring with the Blender Pen, and showing off the beautiful Birthday Bouquet designer series paper from the Occasions Catalog. Next is the very talented Heather Van Looy! Have you ever tried the Floating Re-inker technique? Very pretty Heather, love your designer paper mix. The square card design is great too! Isn't that designer paper great, you can mix and match and everything coordinates. Your calla lily is beautifully done. 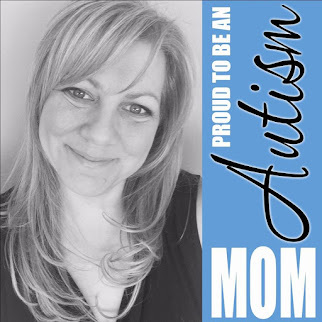 Lovely card Heather. I love the polka dots and the flowers!! !You did a great job here. Beautiful.